Offering good advice, whether you want it or not. And For Something Completely Different . . .
As I mentioned in my previous post, the Four Schools of Thought for Ceiling Register Placement are 1. Register Over the Window, 2. Register interior to room., 3. Register in Center of Room, and 4. High Sidewall Register. All four schools of thought can work just fine (in terms of comfort), when done correctly. Comfort, however, is not the only factor to consider. 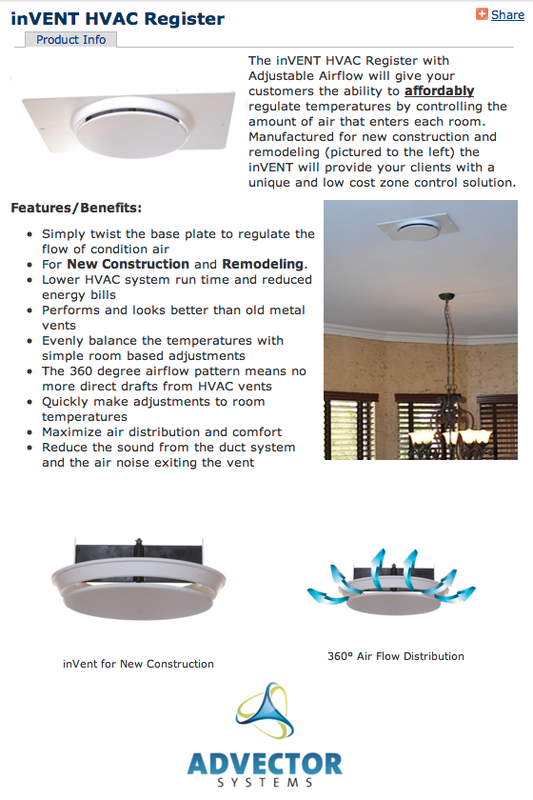 Energy efficiency, materials efficiency, ease of installation, and aesthetics are all things to consider as well. This post will look at all of those factors for this particular school of thought: Register Interior to Room. By the way, unless I say otherwise, I’m focusing on cooling mode on a very hot day. I also highly recommend that you find some register manufacturer catalogues and learn how to read them. There are some very important performance factors that you should understand. Throw distance, sound rating, pressure drop, etc. It’s more complicated than you think. ACCA has a Manual T (Terminal Selection) that discusses all of these, but it is a bit out of date. Like I said, it’s easy to screw these up. I’ve seen two-way registers put in this location. Not good. Half of the air goes right out the door. The other half never helps the room volume near the window. If you notice in the top view diagram, above, some of the air goes right out the door. I call this “short circuiting”. It would be better if that air stayed in the room longer. The one-way register does not have this problem. It can be minimized in the three-way register by using the adjustable control dampers behind the face blades to direct the air toward the exterior wall. I have set up a pretty simple test rig using a duct tester fan and a fog machine to show that you can get most of the air to go that direction without reducing airflow significantly. I almost forgot! 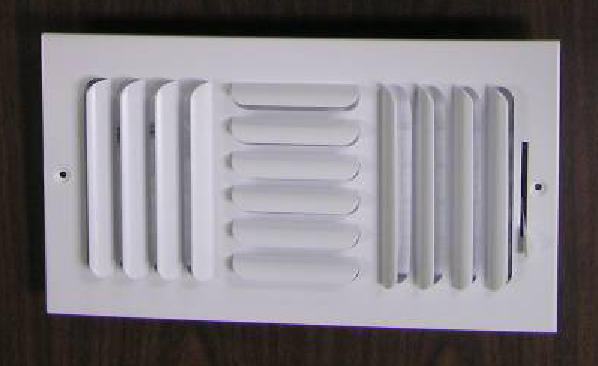 I couple posts ago I posed a little quiz question: What’s better for heating a room, floor registers or ceiling registers, and why? Most people will say that floor registers are better because hot air rises. Sorry, that is incorrect. Yes, hot air does rise, but you have to remember the sole purpose of a supply register: to efficiently and effectively MIX the conditioned air with the room air. One very good rule of thumb (as much as I despise most rules of thumb) is to blow the air in the opposite direction that it will naturally want to go. If hot air comes out of a floor register it will go up . . . and stay up. This does not promote good mixing. In fact, it promotes stratification. If you blow hot air downward, it will reach close to the floor (with a properly selected register) and then begin to rise, but by that time it has mixed with the room air making it less likely to stratify. This same rule of thumb can work for a register in a room. Blow the air in the opposite direction that it will naturally want to go. In a typical room the natural direction is out, toward the door, back to the return. Assuming that the return is out in the hall, better mixing is achieved by putting the register near the door and blowing it away from the door. This is why the interior register tends to work better than the register over the window. 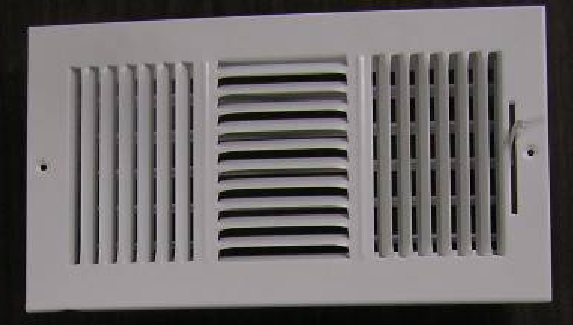 Another benefit is less ducting, which equates to less resistance to airflow and conduction. Next post: School of Thought #3 – Center of Room. The most common location for new homes built in Las Vegas! As I mentioned in my previous post, the Four Schools of Thought for Ceiling Register Placement are 1. Register Over the Window, 2. Register interior to room., 3. Register in Center of Room, and 4. High Sidewall Register. All four schools of thought can work just fine (in terms of comfort), when done correctly. Comfort, however, is not the only factor to consider. Energy efficiency, materials efficiency, ease of installation, and aesthetics are all things to consider as well. This post will look at all of those factors for this particular school of thought: Register Above the Window. By the way, unless I say otherwise, I’m focusing on cooling mode on a very hot day. Putting a register above the window seems to be one of the most common locations in homes for many, many years. It also seems to have the most ardent and dedicated (aka, stuck in their ways) practitioners. Having put about 2000 residential HVAC designs to paper, I’ve received a lot of, shall we say “comments” about my plans. No matter where I put a register, there was always an HVAC contractor who did not like that location. The one location that most contractors would insist on was over the window. The reasoning went from logical (this directly addresses the major load in the room), to rule of thumb (I was always taught that you had to “wash the windows”), to experience based (I’ve been doing it this way for 30 years and it has always worked fine), to nutty (it pushes the heat/cold back out the window). When done correctly it can be very effective and maintain good comfort, but it does have some serious drawbacks. The correct way to do this option is to use a two-way register oriented parallel to the window. alternatively and bar-type register can be used with the air directed in a manner similar to a two-way register. Using the wrong register can seriously screw this option up. I’ve seen three way registers located here, but blowing back into the room or worse, blowing directly on the window. Both of these can result in serious comfort and energy issues. compared to other locations, it requires the most ducting, which increases materials costs, conductive losses, and pressure drop. If the roof pitch drops down over the window, the register boot can be very close to the roof decking. Because the air only comes out in two directions it doesn’t mix as well and can cause cold spots if directly in the path of the airflow. If located too close to the window, it can blow air directly on the window. This increases the delta-T across the window, increasing conduction through the window. As promised, here are the “Four Schools of Thought on Ceiling Register Locations”. See diagram below. OK, so the fourth option is technically not a ceiling register, but it is often used as an option. First some assumptions: 1. slab on grade house, floor registers are not an option; 2. 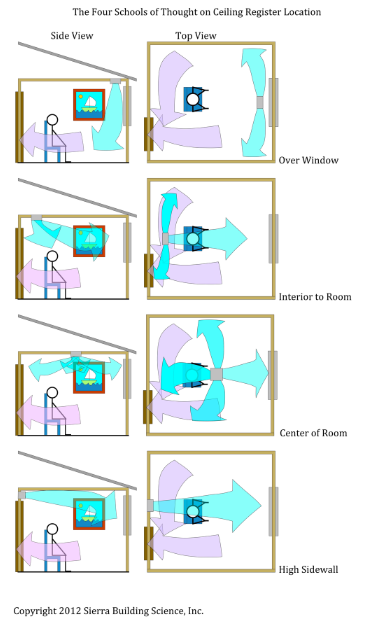 It is a standard sized bedroom with a door on one side and a window on the opposite wall; 3. the return grille is outside the room; 4. the diagrams show cooling airflow (heating would be similar. The blue arrows are the primary flow direction, which is the direction of the airflow caused by the velocity and momentum of the air as it leaves the register. The purple arrows show the secondary flow direction, which is the direction of the airflow after it has lost its initial velocity. Another way to think of secondary flow direction is the direction the air already in the room moves right when the system fan turns on. Generally speaking, this is the direction the air is going to go to reach the return grill. I’m sure all of you are dying to know which one of these is the best! Well, I hate to burst any bubbles but, when done correctly, they all are very, very close. They all have pro’s and con’s, which will be discussed over the next few posts, but in terms of comfort, which is based on even temperature in the room, they are all very close. Notice that I was very careful to say “when done correctly”. It is very easy to screw up any one of these by using the wrong type of register. The first option should always be a two-way register, never a three-way or one-way. The second option should always be a three-way, but one-way registers can work too. It should never be a two-way. The third option should always be a four-way, possibly a three-way or circular (radial) register. The fourth option should always be a bar-type register directed perpendicular to the wall. The Next Best Thing Since Sliced Bread!!!! Or not. I stumbled upon this little ad when I was looking for a good price on the foam I use to build Duc-Blocs. I’m sure that the good folks who spent many tens of thousand of dollars developing this product and brining it to market understand the concepts of Manual D and Manual T (not to mention S, RS, H, P, – oh, yes – and J). Hopefully they weren’t just pandering to granny’s and uncle Joe’s desire to muck with the airflows in each and every room of the house. Ay, caramba. My next post will be a discussion of the “Four Schools of Thought on Where to Stick a Supply Register in a Room”. Until then, can you guess what they are? Here’s a little quiz question to dwell on: What’s better for heating a room, floor registers or ceiling registers, and why? This is NOT a good way to condition your crawlspace. There is a lot of confusion out there about the purpose of conditioning crawlspaces. In other words, why would you want to? From my (biased) perspective, the MOST IMPORTANT reason to do this would be to get your ducts inside the conditioned space. 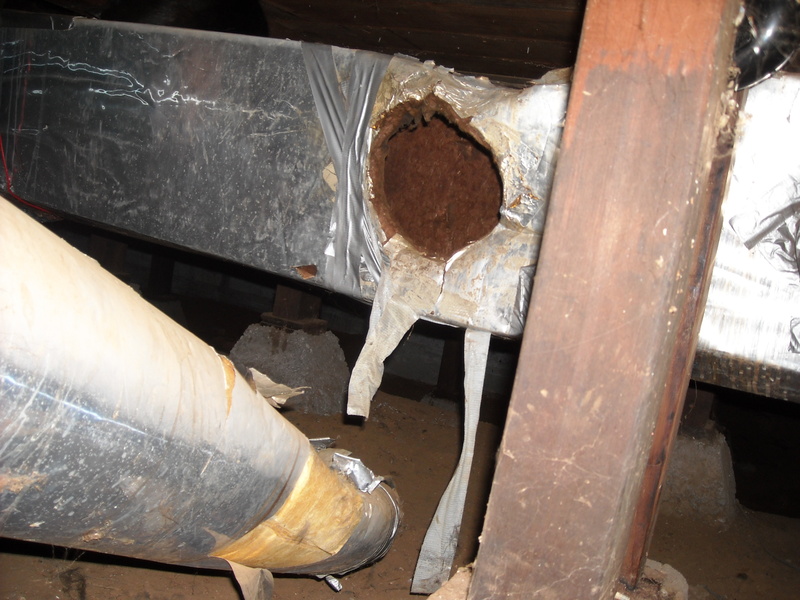 If the ducts are not in the crawlspace, all the other reasons make it a tough sell. So, this got me to thinking. What would the ultimate conditioned crawlspace look like? First, I would start with a single story home with really tall, super-insulated walls, say ten feet, and an insulated slab on grade floor. Then I would install all of the supply ducts right along the concrete floor. Once they were all in, I would install a removable metal grid floor so that it just clears the largest diameter duct. Granted, this would look strange, but the point is that now any losses from the ducts would certainly benefit the conditioned space. You would still want the ducts to be properly sized, well sealed, and reasonably insulated. If the ducts leaked, the air would not be going to the register where the air was intended to reach. This is not so much an energy issue as it is a comfort issue. The BTU’s are still inside the conditioned shell, it’s just that they are not where they are supposed to be when they are supposed to be there. This may result in very small temperature variations between rooms. If you think about it, though, when is the airflow ever perfect? NEVER! Even if you balanced the system down to the exact CFM at every register. There is no single set of room-by-room airflows that is perfect. The ACTUAL room by room loads on a house vary as the sun moves through the sky, as people move around a house, as lighting and appliances are turned on, and as doors and windows are opened and closed. So, condition that crawlspace, make sure it is clean and well insulated, let it communicate with the house, don’t freak out over sealing (or insulating) the ducts, and size those ducts right! I’ve decided that I need a new unit to help me teach air conditioning concepts. Everyone knows what a BTU is, right? British Thermal Unit. Those snobby, sophisticated little units of heat that are about the same as a wooden kitchen match. So, what happens when you take a stream of cold air and blow it into a warm room? Are you “adding coldness” to it? No! Any good BTU Geek will tell you that you are displacing BTU’s in the room air by diluting them with air that has less BTU’s, at a rate determined by the heat capacity of air and the volumetric flow rate of the entering air, blah, blah, blah. I lost you already, didn’t I? What does an air conditioner really do? They are rated in BTU’s, units of heat, not units of coldness. Well, yes, they extract heat from the air, but how is that really different than adding coldness? Who’s to say that we aren’t adding coldness to the room? Who made that law? So, to better understand air conditioning and cooling, I’m proposing a new unit. I call it a BCU, which is short for “Bubba’s cooling unit”. I call it that because it is not sophisticated, but it gets the job done. From now on if someone asks me how much cooling something needs, I’m going to tell them in BCU’s. When I teach people about cooling, I’m going to explain it in terms of adding BCU’s. Wish me luck with that. The purpose of this blog is to communicate to everyone who may be interested in learning more about the things I know a bit about. Training for all of the above. Thank you for stopping by. Please click the “Follow” link to receive notifications when I post new discussions. 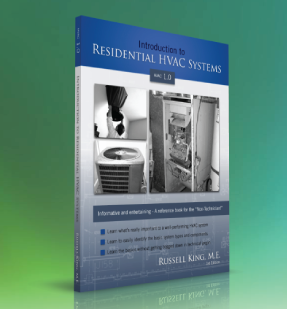 New 3D HVAC Design Software – Finally! !